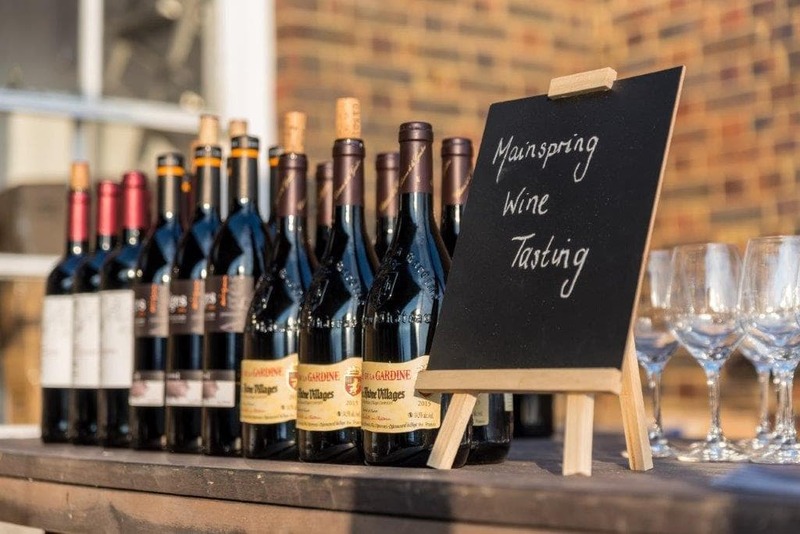 In June, Waud Wines hosted a France versus Spain theme wine tasting for our corporate client – Mainspring Fund Services. They had a wonderful outdoor terrace at their offices which made for a beautiful location and evening hosting 60 of their staff and clients. After a sparkling reception with our impressive magnums of Mas de Daumas Gassac Rose Frizant – we wanted to give the guests a beautiful and interesting white wine from Spain. Verdejo is an light wine that grows almost exclusively in Spain. This wine is interesting and leaves your palate surprised with fruit and citrus flavours. We selected Flor de Vetus 2016. Next up as a nice comparison to the Verdejo we decided to show one of our most popular selling wines and a definite crowd pleaser. A beautifully crafted bottle and a freshness that leaves the palate wanting more – Brunel de La Gardine Côtes-du-Rhône Blanc 2016. There was a clear majority of red drinkers in the room so the next part of the evening seemed to go very well – a lot of people surprised how much they loved the next 4 wines. First red of the evening – Labranche Laffont Tradition 2013. This little beauty is from Christine Dupuy at Labranche Laffont in Madiran. A predominantly Tannat wine with hints of Cabernet Sauvignon & Cabernet Franc that make for a very balanced wine. To compare, we popped back over to Spain for one of our favourites – Clos Pons Alges 2012. For the quick fire, blind tasting round, the guests were given 4 multiple choice questions. They had to guess region, grape variety and year – and if they were right, they would win a magnum of our Mas de Daumas Gassac Rose Frizant. Fortunately there was no need for a tie breaker, as only one guest managed to work out that the Lavia was from Bullas (in Spain), was the Monastrell grape variety, and was 2014 vintage. For our top gun wine of the night, another crowd pleaser and stunning wine – From the famous Chateau de la Gardine in Rhone – Chateau de la Gardine Cotes du Rhone Villages 2015. We had some amazing feedback on this wine and was all round favourite of the night.